The convergence of three major oceanic currents is largely responsible for the incredible mix of marine life in the Galapagos. Charles Darwin sailed to the Galapagos aboard the HMS Beagle in 1835. His research in the archipelago helped inspire his famous theory of natural selection. 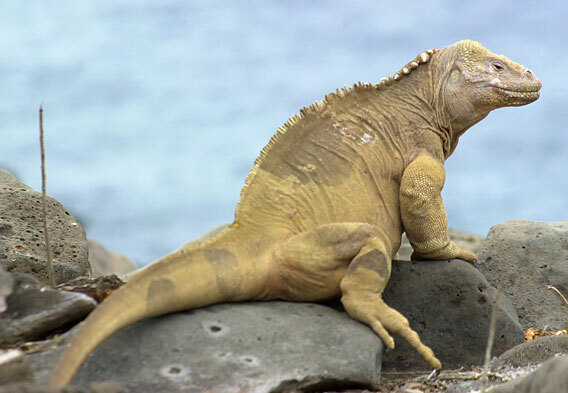 The Galapagos marine iguana is the only lizard that swims in the ocean. Galapagos National Park was established in 1959, making it Ecuador's first national park. In 1978, the Galapagos Islands became the first UNESCO World Heritage Site. The Galapagos Islands are volcanic in nature and have had around 13 volcanic eruptions in the last 100 years. Due in part to their relative isolation, the Galapagos Islands are home to some pretty unusual wildlife. In fact, this Ecuadorian archipelago is famous for its endemic species, which are found nowhere else on the planet. Among the most renowned animals in the Galapagos Islands are the giant tortoises, which can live to be more than 100 years old. Animals certainly take center stage in this island chain, though it isn't just the curious creatures that warrant a visit. Most of the Galapagos Islands are part of a national park, and while human intervention has been on the rise in recent years, pristine landscapes abound. Among the noteworthy landscape features are steep cliffs, crater lakes, lava tubes, and coral beaches. The Galapagos Islands are best known for their wildlife. More specifically, the archipelago's fame is largely tied to its endemic species. In 1835, Charles Darwin spent five weeks surveying the island chain, taking astute notes on the resident wildlife and the geology of the archipelago. This visit helped inspire the famous naturalist's development of the theory of natural selection. 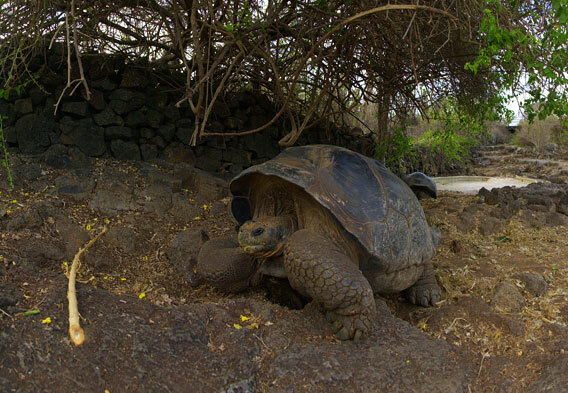 The most distinctive of the Galapagos animals is the giant Galapagos tortoise. No less than 15 subspecies of these large turtles have been recorded in the Galapagos. Four of the recognized subspecies are now extinct. Other well known Galapagos animals include marine iguanas and blue-footed boobies. Marine iguanas are only found in the Galapagos Islands and are unique among modern lizards for their ability to live and forage in the sea. Blue-footed boobies are long-winged seabirds that are popular among Galapagos visitors, largely because of their distinctive blue feet. These certainly aren't the only interesting Galapagos animals, and understandably so, many Galapagos tours include wildlife viewing expeditions. As a side note, the wildlife of the Galapagos Islands is quite fearless on the whole. This relative absence of fear is tied to the lack of large predators in the archipelago. Ecuador's Galapagos Islands archipelago consists of approximately 3,000 square miles of land and is spread out over 17,000 square miles of ocean. The largest island is Isabela, measuring approximately 2,250 square miles. 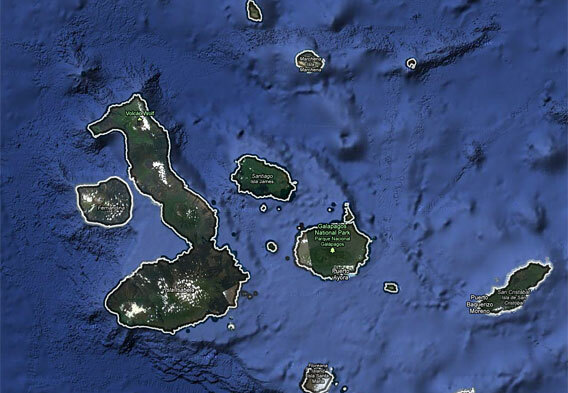 This island also claims the highest point in the Galapagos - Volcan Wolf (5,600 feet above sea level). Espanola is the oldest island at around 3.5 million years. Of the 13 major islands in the chain, only four are inhabited by people. Santa Cruz is among the inhabited islands and has the highest population. Due in part to its bustling harbor and the fact that it has the only real luxury hotels in the archipelago, Santa Cruz serves as a popular Galapagos travel base. 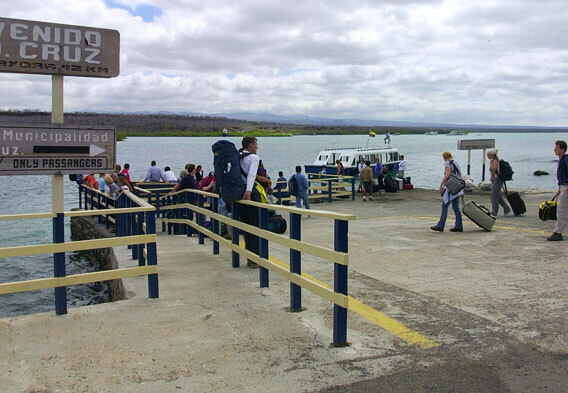 As for getting to the Galapagos Islands, most people arrive by way of plane. The two islands with airports are San Cristobal and Baltra. Once in the islands, getting around by way of boat is the only option of choice. It should be noted that all of the islands in the Galapagos have their own allure. On the island of Bartolome, for example, you can climb to the top of an extinct volcano, and Fernandina is one of the best islands for wildlife encounters. Basically, prospective visitors are encouraged to consider as many islands as possible when trying to plan their Galapagos itineraries. As mentioned, going by boat is the only way to get around once in the Galapagos Islands. Numerous companies offer Galapagos cruises, often with pre-set itineraries that can help take the stress out of planning a visit. Travelers fly to the islands first and then board their boats of preference. The vessels that are used for Galapagos cruises vary in size and comfort levels. Some boats can be chartered by groups who are interested in private cruise experiences. It is also worth noting that only a limited number of cruises offer the opportunity to scuba dive. Often times, travelers can find some really good deals when booking a Galapagos cruise at the last minute. Quite simply, your average cruise company would prefer to sell spaces at a discount rather than have empty staterooms. Trying to book a Galapagos cruise at the last minute comes with its risks, however. More than anything, you might not find a ship with any openings, especially during the June to September and late December to early January high seasons. Consulting a Galapagos map is recommended before you arrive in the archipelago. If nothing else, it can help you get an idea of the layout of the island chain. The majority of the main islands are south of the Equator, and these are the islands that most travelers stick to. Those that are found north of the Equator, an example being Genovesa, are usually only visited on longer tours. Santa Cruz is a popular tourist base in part because of its central location. On a broader scope, it can be fun to look at a more wide-scale map that shows the location of the Galapagos in relation to other landmasses. You'll soon understand why most visitors fly to the archipelago. As a side note, it is interesting to consider that 97 percent of the land area of the Galapagos Islands is a national park. Galapagos National Park was established in 1959, making it Ecuador's first national park.